Dragon is taken to the grave of Alex Wilde so that he can accept that she is truly gone. Frank Darling talks about how one of Horde’s Wicked Worms possessed the hero and sent him on a rampage where he killed thousands, including Alex. Dragon notes that when he encountered William Jonson he mentioned that Alex had been living in Elgin but this is revealed to be an Alex Foley, a young man who joined the Chicago Police Department shortly after the rampage. Dragon was spared getting ran out of town when the last Wicked Worm confessed his guilt in the affair and was executed via the electric chair. The lack of DarkLord’s presence in this reality is considered, starting with the original Nega-Bomb’s detonation that scarred the teenaged Young-Tough and turned an innocent bystander into CessPool. Without his alterations of time, Young-Tough never went on to become Mace and therefore could not halt Dragon’s rampage. Frank continues by saying that it was around this time that Dale Fisher sought out the Creator and was transformed into the Demolisher. This became a popular trend as many of those left in Chicago visited the Creator as having powers meant that they could survive easier. Frank could not bring himself to remain on the police force once CyberFace took control and he quit, opening up a general store instead. He lost his arm to Dragon during his rampage, just before he killed Alex. Frank does not blame Dragon for this injury; he simply wished that his healing factor had fought off the leech’s poison sooner. CyberFace could have halted the destruction but at that point he was in New York City defeating the Cosmic Cops and claiming their technology. This arsenal of weapons enabled him to fend off the Martians’ attack. With the weaponry from both races, the villain was soon able to seize control over the whole planet. Dragon talks of his plan to seek out the Vicious Circle with the help of Neutron Bob but his ally remains lost in a pile of rubble. He cannot search for him at the moment as CyberFace’s robot drones are sifting through themselves, hoping to find Dragon amongst the devastation. Frank takes his friend back to his store where they rest up and get some food. The missing money that had been stolen from a Detroit bank is uncovered as Beast Boy and Feezle continue to rummage through the collapsed building, causing the pair to abandon their search and flee with their discovery. After returning to their sightseeing, Dragon takes Frank to the location where he first emerged in this reality. He runs down the history of DarkLord as he searches for the burnt corpse of the late Damien DarkLord. This body is nowhere to be found and Dragon suspects that perhaps his mother, Liberty, made off with it. Frank suggests that perhaps they should note down all of Dragon’s thoughts so that they can compare his memories to the events that took place in this world. Dragon mentions Jennifer Murphy and is relieved when Frank confirms that not only were they a couple here but that he believes that the missing woman is still alive. She had decided that Chicago had gotten too dangerous and packed up her belongings, leaving with her daughter. The pair makes their way to the tree house city where WildStar had brought Dragon but they find only the remains of the dead there. Frank’s involvement in the rebellion worries his best friend as Dragon fears that his lack of powers puts him in a tremendous amount of danger. Although this may be true, Frank points out that he has a great deal of influence in Chicago as he is the sole source of food and supplies in the city. When his store first opened the supply trucks were hijacked but that soon stopped when those responsible realized that the deliveries would stop altogether if the thefts continued. Dragon is then taken to meet a potential new ally in the form of Rex Dexter, a scientist who is as brilliant as he is nervous about his discovery. Rex has spent some time creating a laboratory that is hidden from CyberFace’s sensors and is worried that Dragon being brought there has exposed his position. Frank points out that had Dragon been detected then they would have come under attack by then. Dragon requests the aid of Rex but he is too preoccupied with saving the structure of the entire planet from tunnels being dug under the orders of the Atlantean. The king of Atlantis’s death is announced by Dragon which should free up Rex to assist in his plans. This news distresses Rex as he had been spending every waking hour working on a suit of armor that would enable him to confront the Atlantean. His daughter has been lost in the “Void” for years with only a man named Sterling Mason to protect her and he could have been working on rescuing them instead of working to stop the Atlantean. Dragon promises to search for the pair if Rex first helps him work on a way to defeat CyberFace, suggesting a sophisticated computer virus or some other way to negate his powers. Dragon senses that his efforts are going to waste and departs with Frank who confirms that Rex used to be the hero Battle Tank, part of the Liberty League in the 1960s. Rex had to retire by the 1980s after his fourth heart attack and was succeeded by his bodyguard, Sterling Mason. He had been in the process of training Rex’s daughter Lexie to take over when they were lost in the Void. The Demolisher is frustrated that he cannot locate his hated enemy and threatens a number of innocents with death unless they locate Dragon for him. With his options diminishing, Dragon decides that he should try and locate Rapture, hoping that his former girlfriend is still alive in this reality. He meets several women that he knows to be former friends of Rapture, leading him to his quarry. 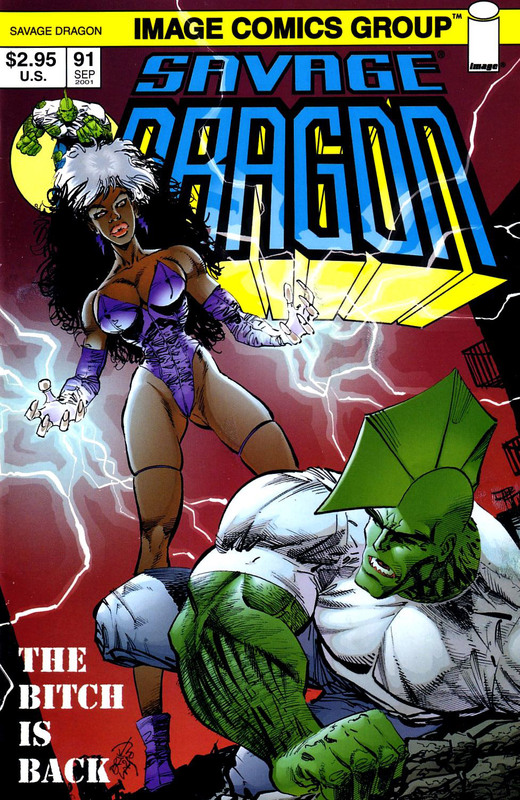 Dragon attempts to explain why he has come for the super-powered prostitute but she assumes that he has come to arrest her, wrongly believing that Dragon is still a police officer. Rapture repeated attacks the hero and through her words it soon becomes clear that something has happened to drive Rapture insane. After she delivers a powerful electric shock to her foe, Rapture flees into the alleyways. Dragon soon recovers and informs Frank that this had been a dead end and he is left with only option; to try and recruit the Vicious Circle. Frank offers up some food for thought; suggesting that perhaps someone traded his mind with that of a counterpart in another reality. It is wondered if perhaps this architect of events wishes for Dragon to use knowledge from his own reality to fix this one. Dragon considers this theory and agrees that he should give it some more thought before he makes his next move.